The damage to the slate tile in this picture is consistent with similar damage found in many historic neighborhoods including Compton Heights, Carondolet, University City, Clayton, Tower Grove, Holly Hills, Central West End, Bel-Nor/Normandy and Pasadena Hills. Over the past two years there have been two severe storms (May 25, 2011 and April 28th, 2012) that have done significant damage to numerous homes in these neighborhoods. 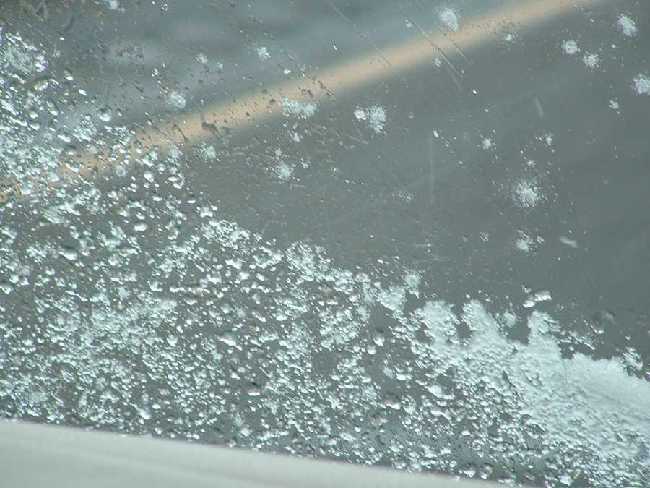 According to the NOAA archives, during the storm on May 25, 2011 there were reports of hail of between 2.5 and 2.75 inches in diameter reported at the intersection of Grand and Highway 44 (less than ½ mile from the Compton Heights neighborhood). In many cases this hail was large enough to completely destroy the roof that protects your home. The Compton Heights and other historical neighborhoods were hit particularly hard from this storm. Because most homeowners are not comfortable inspecting their own roof and because the damage is not easily observable to the untrained professional, many homeowners wait far too long before having their roof inspected. In many circumstances the first inspection does not occur until the homeowner observes watermarks or some other type of internal damage. This long wait usually results in much more serious and costly long term problems such as wood rot, mold and interior damage which the insurance companies view as neglect of routine maintenance instead of “an Act of God.” The end result is that the homeowner becomes responsbile for these repairs. While many homeowners are entitled to a full replacement of their roof at little or no expense (from their insurance company) many contractors fail to recognize the extent of the damage and recommend routine maintenance which may fix the problem in the short run but fails to correctly fix the problem long term, and ultimately leads to the homeowner spending significantly more money than necessary. 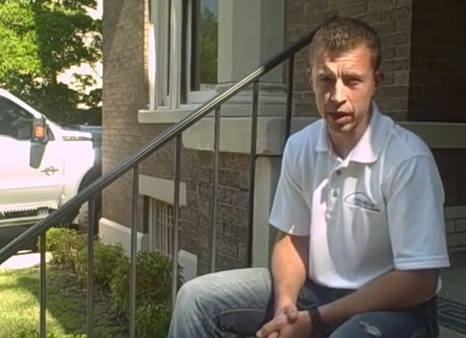 In the past two years Innovative Construction and Roofing has assisted over 200 homeowners in St. Louis’ historic neighborhoods replace their roofs at little or no out of pocket cost. In addition to providing peace of mind, this helps to preserve the historical landscape of the community while also increasing the overall market value of the property. After roof replacement, the average increase in home value in the St. Louis area is $65,000. If you live in any of these areas, your roof may qualify for full replacement paid for by insurance. This requires a 30-45 minute inspection of your roof by a certified slate and tile roof inspector to determine if your roof qualifies. To schedule a convenient time to have one of our experts conduct a thorough inspection of your roof please call 314-546-4047 or complete the inspection request form on this website. There is no cost for the inspection and there is no obligation for you to follow any of our recommendations, or use our services. Regardless of whether your roof is still structurally sound, is in need of repairs, or needs to be fully replaced, every homeowner in the path of this storm should have a thorough inspection done by a HAAG certified engineer. This will protect you from any surprises down the road and you are always covered due to the fact that you proactively handled the situation. This will help ensure that small problems don’t become big problems, which your insurance company will view as neglect instead of an “Act of God”, thus holding you responsible for the expense after 12-24 months. We have a storm team on the ground ready to assist any residents from Dickson to Lebanon and in between. 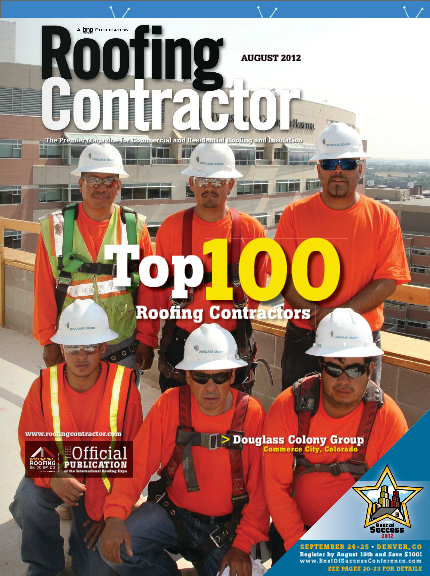 Innovative Construction & Roofing is proud to announce that we have been recognized by Contractors Magazine as the #50th Largest Roofing Contractor in the USA. This surpasses our #85 last year. Our tremendous growth is a huge honor and we are very proud of all our employees and subcontractors that made this possible. A special thanks to ALL who have chosen to work with us! 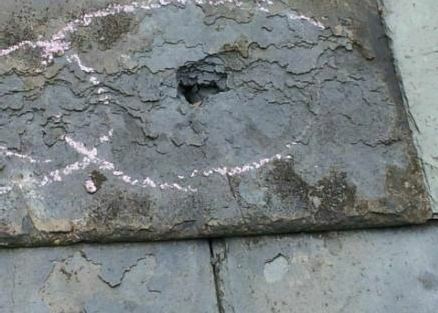 This video reviews some of the damages that can occur to a slate roof. If you have a slate roof that may have been affected by a recent storm, please contact the trusted professionals at Innovative Construction and Roofing for your free roof inspection, condition report and damage assessment today at 866.750.8097, or visit us online at Innovative Roofs.com. We have offices in St. Louis, Kansas City, Tulsa, Oklahoma City, Indianapolis, Houston, Wichita, and Nashville. The availability of both federal and state tax credits have certainly encouraged investment in Missouri’s historic structures across the state for many years now, but historic home building owners as well as those who manage and maintain them have not maximized the preservation potential due in part to a lack of awareness and understanding of the guidelines, process and assistance available to them. For a home or building to be eligible for the state or federal credits it must be deemed historic, meaning either listed individually in the National Register of Historic Places, a contributing element of a historic district that is listed in the National Register of Historic Places, or a contributing element of a Local Historic District that has been certified by U.S. Department of the Interior as substantially meeting National Register criteria. eye for detail, and a true craftsman’s skill. Roofing contractors who are experienced in this type of restoration work understand the requirements of vintage roofs for decking and underlayment, as well as when modern materials can be substituted without causing the roof to fail or leak. Many historic homes and buildings in Missouri still have their original slate or tile roof systems, and although both are designed to last over 100 years the underlayment can fail after the first 50 to 75 years. Anymore, many historic home preservation committees will not allow a shingle substitute for a slate roof, which happens to be the recommendation of most insurance claims due to the roofing contractor hired to perform the work not having expert knowledge in this area of specialty. 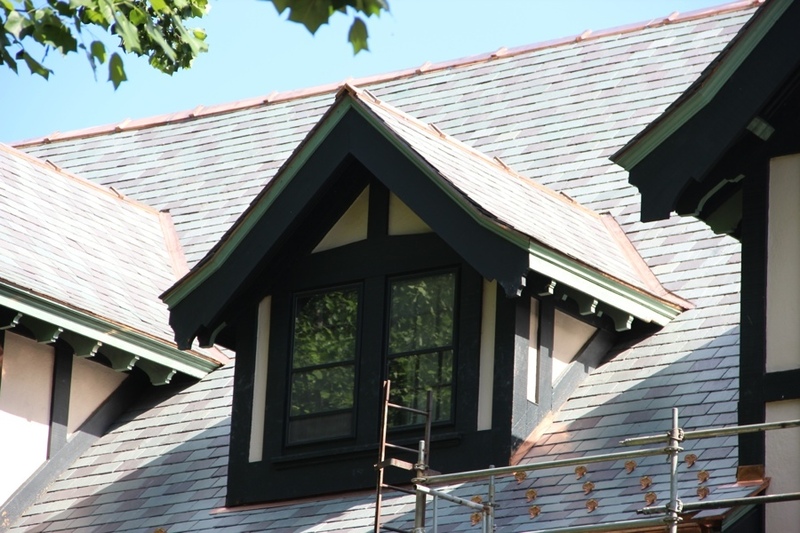 Truly, the art of slate roofing seems to have been lost and unfortunately the only way Missouri’s historic districts will remain as such is with restoration projects like those recently completed and currently underway by the team at Innovative Construction & Roofing (ICR). After early spring storms in 2011, residents in Shaw/Tower Grove, University City and South City are now seeing major transformations with 100+ year-old slate and tile roofs being fully replaced by insurance companies while maintaining their historical status thanks to the ICR team already completing 30 jobs in these neighborhoods and with over 50 currently in process. Several more are planned throughout 2012 as well. 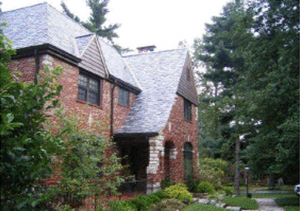 Headquartered in St. Louis and with satellite offices servicing Missouri, Kansas and Oklahoma, ICR has installed the entire spectrum of slate roofing styles and systems. From custom graduations to the full palette of colors, custom sizes and the entire range of finishes, they have done it all. Founded in 2008 by Christian Larson, Brian Benson and Patrick McNichols, the team has more than fifty years of collective hands-on industry experience. By combining the latest in roofing industry technology with the craftsmanship and expert knowledge in restoring historic slate and tile roofs, ICR has quickly become the Midwest’s premier provider of commercial and residential roof, gutter, and insurance restoration construction services. 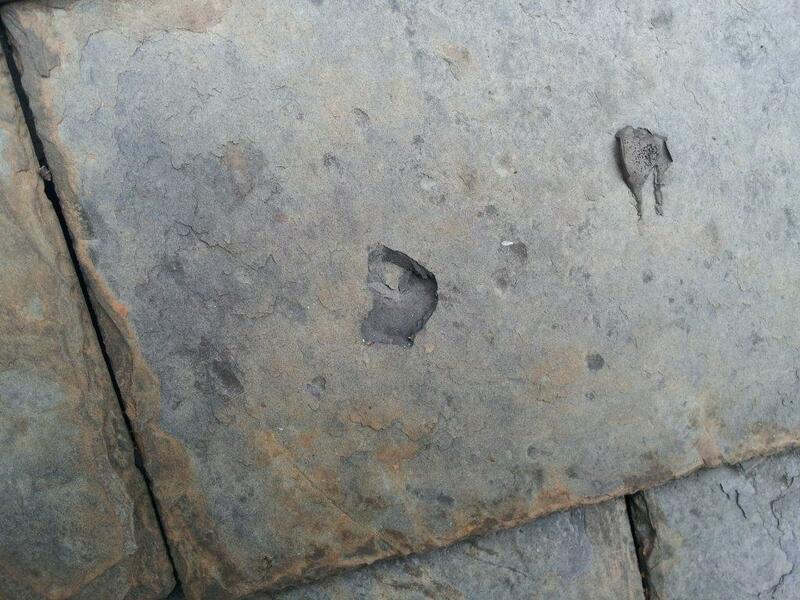 The company is a member of the National Slate Roofing Association and The National Slate Association. If you are considering pursuing a historical preservation tax incentive it is recommended you consult a qualified tax professional and the Missouri Department of Economic Development as soon as possible, and well before you begin the restoration project to ensure it follows the Secretary of the Interior’s Standards for Rehabilitation. The State Historic Preservation Office (SHPO) in the Missouri Department of Natural Resources and the National Park Service works with property owners, developers and architects to provide advice on appropriate rehabilitation. You can find them on Facebook at www.facebook.com/InnovativeRoofs. Recent Customer Reviews from Slate Roofing Customers . . . The St. Louis Business Journal today reported that Innovative Construction has made the Inc. 500 list of America’s Fastest Growing Companies. The publication reported Innovative’s three-year growth rate of 4,159 to place it number 58 on the list and #2 among construction companies. This is a great honor to make this list and it’s only by our customers sharing their experiences with Innovative that this is possible. Thanks again to our customers for making this happen. 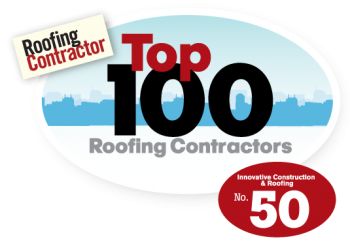 We’re going to make Innovative the top Roofing Contractor of the year! Why? Because we’re the best one’s out there. 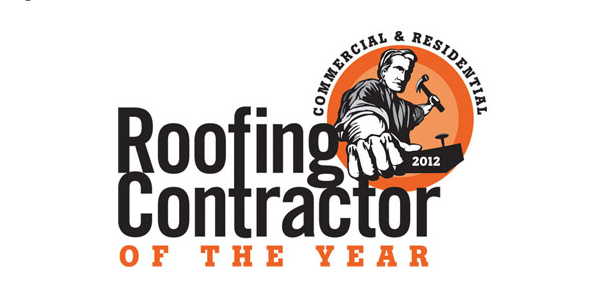 Roofing Contractor is now accepting nominations for the 2012 Contractor of the Year. This is YOUR chance to nominate Innovative Construction and Roofing! Entries end on August 31st, so hurry and fill out the form! All you have to do is click on the following link and choose INNOVATIVE as your choice.